Thelephora anthocephala looks a bit like the unkempt cousin of Lentaria micheneri; it is a coral-like mushroom with tough-fleshed branches that arise from a thickened, stem-like base. But the two species are not even closely related, and Thelephora anthocephala features gray branches that begin to flatten at their tips. 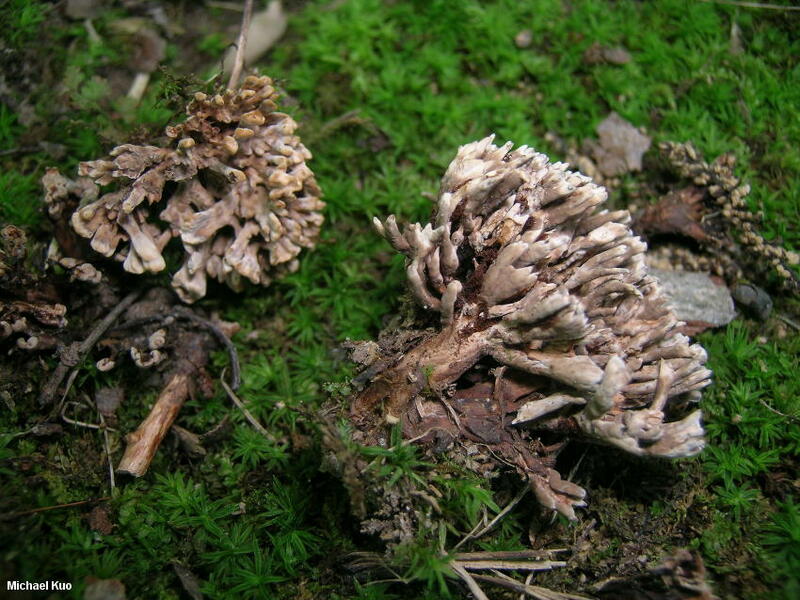 It is associated with hardwoods, turns black with KOH, has no distinctive odor, and has funky, spiny spores. It can sometimes appear like small, immature forms of the well-known, field-guide species Thelephora palmata, but the latter associates with northern and montane conifers, and stinks to high heaven. Our North American version of Thelephora anthocephala is probably not actually the same as the true, European version described from France in the 19th century. Thelephora species are currently defined on the basis of species concepts from the heyday of micro-morphology (primarily Corner, 1968). The few DNA studies that have been focused on the genus at the species-level (e.g. Ramírez-López et al., 2015) reveal the potential for hidden species and significant variability in morphological features within species in the genus. Ecology: Mycorrhizal with oaks and other hardwoods; growing alone, gregariously, or in small clusters on the ground; summer; widespread and common in North America east of the Rocky Mountains, and occasionally reported in the Pacific Northwest. The illustrated and described collection is from Illinois. Fruiting Body: A branching structure 3-4 cm high, with a short stem, or several main stems. Branches: Numerous; arising from shared basal branches or the stem; individually subcylindric at first, becoming somewhat flattened; surface becoming slightly wrinkled; brownish gray with pale gray to whitish apices; apices rounded or subacute. Stems: 0.5-1 cm high; 0.5-1 cm thick; tough; dark gray to black; united basally. Flesh: Stringy; fairly tough; dull tan; unchanging when sliced. 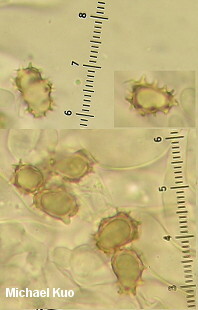 Microscopic Features: Spores 8-10 x 5-6 µ (excluding ornamentation); angular and lobed; covered with spines that extend 1-2 µ; ochraceous to brownish in KOH. Basidia 4-sterigmate; 40-50 µ long; clavate to widely clavate; basally clamped. Subhymenium not bluing in KOH. Tramal hyphae cylindric; 3-4 µ wide; walls smooth and hyaline to brownish in KOH; often clamped at septa. REFERENCES: (Bulliard, 1786) Fries, 1838. (Saccardo, 1888; Corner, 1968; Stalpers, 1993.) Herb. Kuo 06270803.